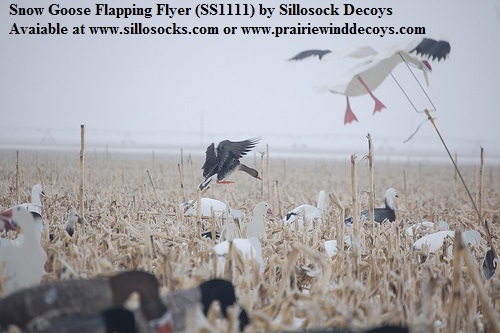 This compact Telescopic Flagging Pole by Sillosocks Decoys starts out at 3 feet. It extends to 12 feet! 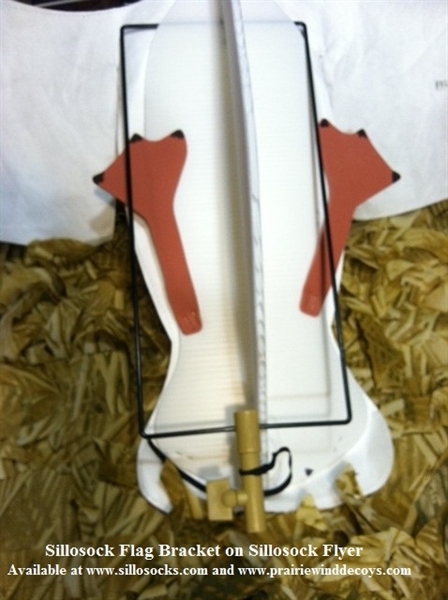 It is lightweight and easy to use to manually flag geese. Simply raise and lower the pole to simulate a goose landing in the rig. 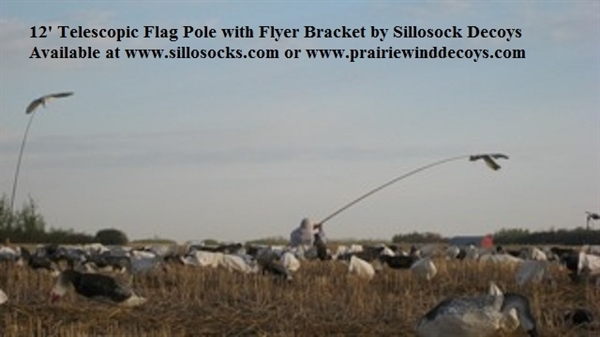 Alternatively, You can use the 12' pole in a Sillosock Rotary Stand. 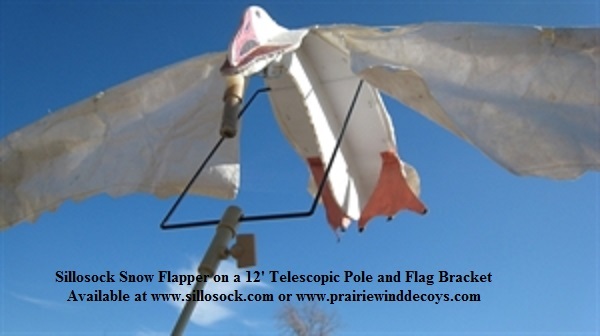 (sold separately) This pole and bracket system works great in high wind. As the pole bends and bounces,....the flyers stays level. 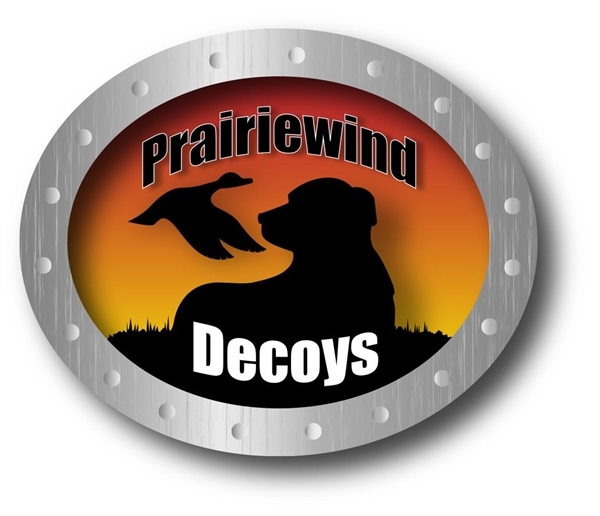 Place 75-100 yards staright up wind of the blinds and have plenty of shells! The 12' telescopic poles comes with a Sillosocks Flag Bracket which keeps Sillosocks Flyers level no matter what the angle of the pole! 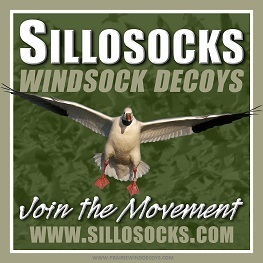 Use with Sillosocks Snow Flyers, Canada Flyers, Speck Flyers, or Mallard Flyers. This system is deadly! This 12' telescopic pole can also be used in a Sillosock Hammer Machine which raises and lowers flyers remotely. This versitile pole will also work great with the new "Just Wings" Spinner Flyers. Made in Snow goose or Mallards. We have been using this pole with great success to "Land" flyers in the spread. The 12' telescopic pole give you huge visibility. Geese can't resist the temptation to come check it out! NOTE: We recommend that each joint be wrapped with vinyl electrical tape to reinforce the pole for higher wind situations. This will help to prevent pole breakage. Wrap 5-6 times just below each joint so the pole can "telescope." 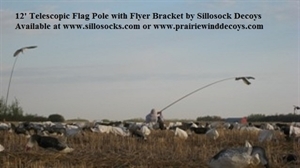 Great on tall 1/4" Flyer pole especially in high winds as it keeps the Sillosock Flyer level!